It is a probably a mistake to compare Seth Alverson to Gerhardt Richter. 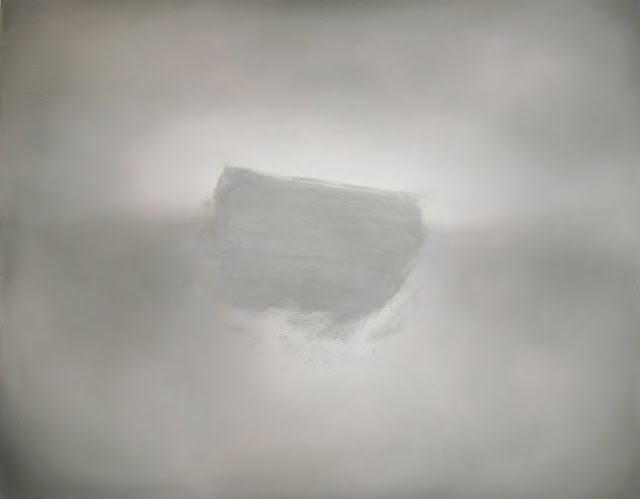 Like Richter, most of his paintings are "realist" paintings. 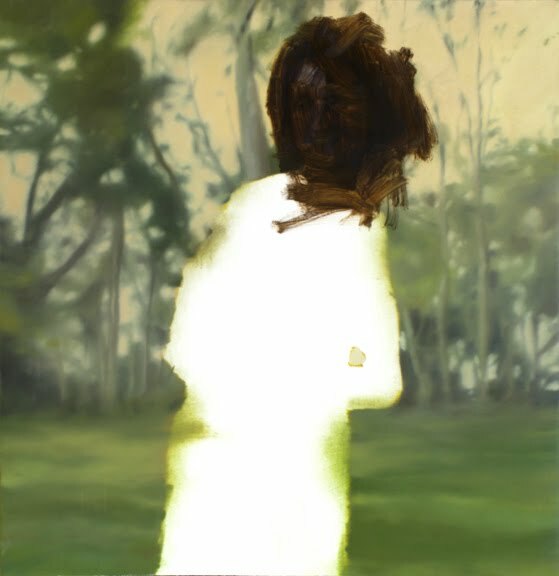 Like Richter, many of Alverson's paintings are based on photographs. Also like Richter, he is willing to paint an abstract painting occasionally. And both painters have strange, intriguing painting surfaces. So I guess there is a basis for comparison, after all. Alverson does really good fabric. 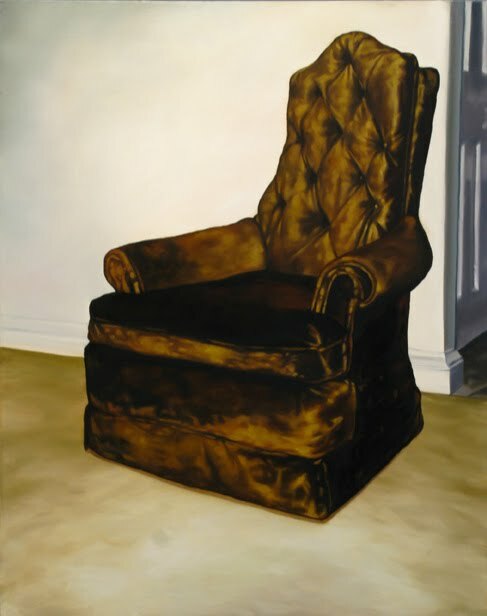 You can almost feel the texture of this chair's upholstery. 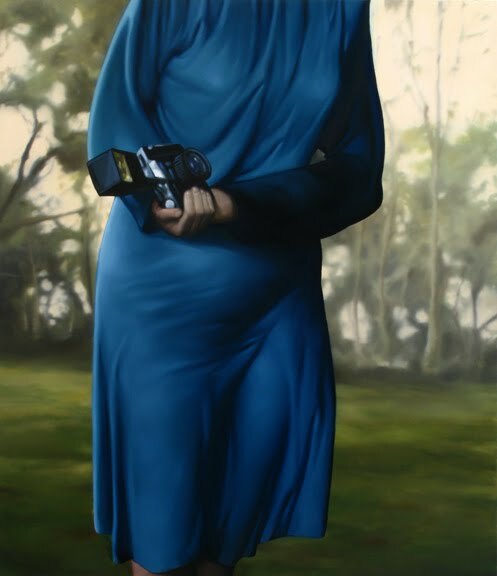 This weird clingy blue dress (on a body that should avoid clingy dresses) pops with hyperrealism from its faded, soft-focus background. But Alverson wants us to know that getting this effect isn't easy. So what's the mistake? Was it that he was going to paint her face but messed up? Or was the mistake the decision to include her face? But what is truly bizarre here is that he displays the "mistake" canvas. Really, that makes you wonder if it was really a mistake in the first place. Is this what he intended? Was there really anything else there? Or is this intentionally a picture of a hand emerging from the gloom. If this is the case, Alverson is playing a little conceptual joke on us. 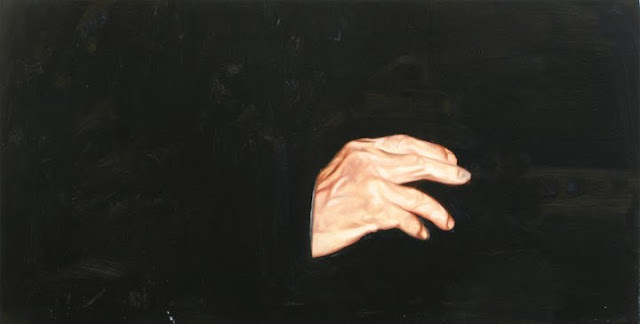 But if it's a painting where he really did paint out everything but the hand because it was "bad," well, displaying it is a really eccentric move. That eccentricity is a real possibility. 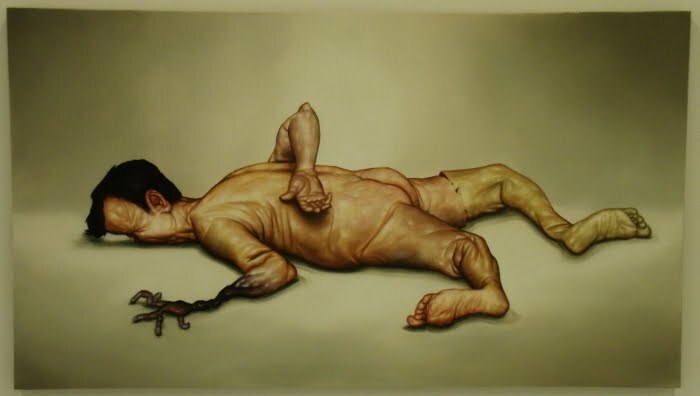 If he isn't having us on, this painting suggests that Alverson's doubts about his art may be the least of his problems. The self-loathing here, the abjectness, is weirdly at odds with the bravura painting technique. 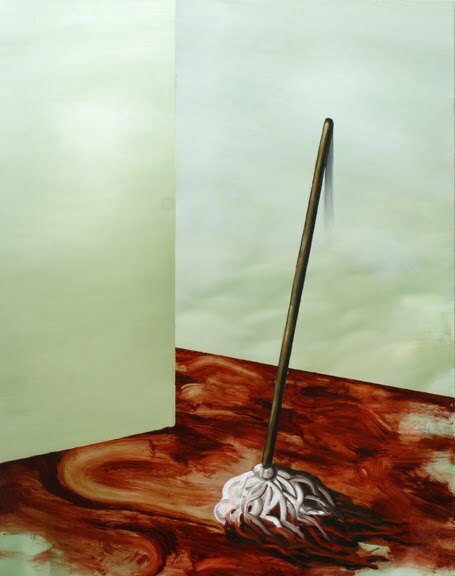 Alverson is no clumsy paint-slinger. But he paints as if he were. The smeared substance here (paint? blood?) contrasts with the beautifully shaded walls. That white on white suggests a way out. Maybe this is another mistake, but maybe it's an approach that creates a peaceful image for the viewer (and painter), without highly contrasting values, without fabric, without bravura technique. Or maybe it's both. 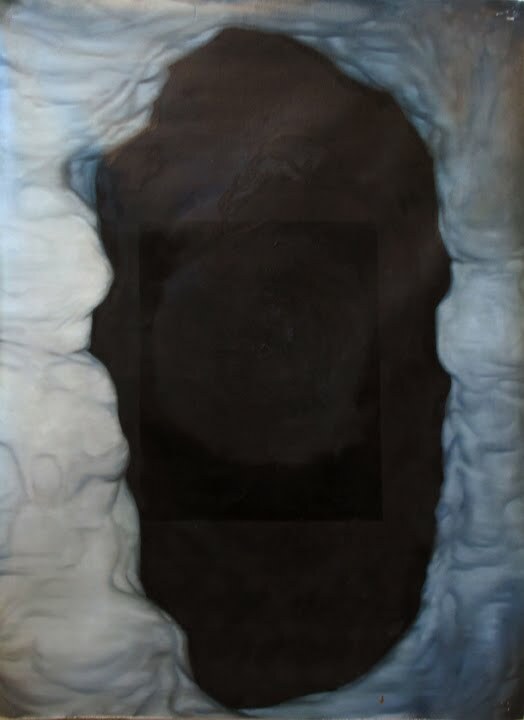 Maybe Alverson started painting something then decided--into the hole of bad ideas! And substituted this abstract cloudscape. Of course, I am probably reading a bunch of things into the paintings that aren't there. They encourage that, though, so no apologies here. These paintings are on view at Art Palace until August 21.
you were right to review seth alversons work of all the upcoming artists in houston. whether you like it or not, one has a lot to say about it, and there is a reason for that. Oh, I like it. that doesn't keep me from being puzzled by some of it, though.